LAS VEGAS, NV, February 28, 2013 — Golden Boy Promotions hosted the final press conference Thursday for the big fight card this Saturday, March 2 live on SHOWTIME® (10 p.m. ET/PT, delayed on the West Coast) and SHOWTIME EXTREME® (8 p.m. ET/PT) from The Joint at Hard Rock Hotel & Casino in LasVegas. LAS VEGAS, NV, February 27, 2013 — When Cuba’s Richar Abril (17-3-1, 8 KO’s), of Miami, Fla., steps into the ring to face undefeated Ugandan Sharif “The Lion” Bogere (23-0, 15 KO’s), of Las Vegas, this Saturday, March 2 in the main event of SHOWTIME BOXING – Special Edition live on SHOWTIME® (10 p.m. ET/PT, delayed on the West Coast) from The Joint at Hard Rock Hotel & Casino in Las Vegas, he will be making the first defense of his WBA Lightweight World Championship. LAS VEGAS, NV, February 15 — The vacant WBA Lightweight World Championship between Richard Abril and Sharif “The Lion” Bogere has been elevated to the main event on Saturday, March 2 and will now be held at The Joint at Hard Rock Hotel & Casino in Las Vegas live on SHOWTIME at 10:00 p.m. ET/PT (delayed on the West Coast). The previously scheduled main event between WBC Featherweight World ChampionDaniel Ponce De Leon and Jayson Velez has been removed from the fight card due to a right ankle fractured suffered this week by Velez. 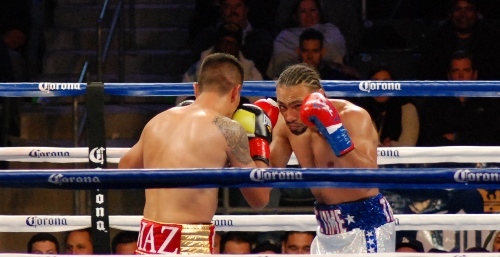 The venue change from Harlem’s Apollo Theater in New York City comes as a result of the loss of the De Leon vs. Velez fight, and the presence of the Mexico vs. Puerto Rico rivalry attached to it, making it less prudent to promote the event in Harlem in close proximity to large Mexican and Puerto Rican communities. LOS ANGELES, CA, September 20, 2011 – Following his exciting 10-round battle with Raymundo Beltran in May in a bout which marked his debut on the hit series ShoBox: The New Generation, NABO Lightweight Champion Sharif “The Lion” Bogere will return to the SHOWTIME® airwaves on Friday, October 7 to defend his title against fellow unbeaten Francisco Contreras at the Dallas Events Center at Texas Station Casino in Las Vegas, Nev. in a rare battle of young, undefeated prospects. Unbeaten Jermell Charlo takes on Francisco Santana in another compelling match-up of prospects on the rise.